Vegas is a food mecca. In recent years in particular, it has taken its place among the great food cities of the world. It makes sense, then, that wonderful appetizers exist all around the area, including in and around the strip. Find 10 of the best places throughout the state for appetizers below. Hundreds of Las Vegas restaurants could have made this list. But Heritage at the Mirage was chosen because of the author’s personal experience with it (along with his unabashed love for Top Chef, which Chef Tom Colicchio hosts). You can’t go to Vegas without having a shrimp cocktail. Their Gulf Shrimp Cocktail may sound simple, but the flavors will blow you away. The Star Hotel Basque Dining in Elko, Nevada offers “excellent European style food in an old-world atmosphere.” Homemade soup, salad, Basque beans, pasta, a vegetable dish, French fries, and coffee are served with every family-style entrée. We recommend springing for the sautéed mushrooms for an extra appetizer. Great Full Gardens of Reno, Nevada has a simple mission: to “support people’s choices to eat healthy by creating a restaurant concept that works for every lifestyle.” If you’re watching what you eat but still want to indulge in an appetizer, this might be the place for you. Consider the smoked salmon roll-ups or avocado bruschetta for healthier options. Los Lupes Mexican Restaurant has a flagship Mesquite location and a new one in Las Vegas. They’ve been in business for over 17 years serving delicious, authentic Mexican cuisine out of their mesquite location. It may not seem like a lot, but their guacamole dip with chips is worth the trip alone. Lucky Beaver in Stateline and Reno, Nevada offers progression jackpot video poker machines and delectable appetizers 24 hours a day. According to Lucky Beaver’s website, they’ve “become renowned for [their] mouthwatering steaks and burgers sourced from world famous Pat LaFrieda Meats.” We recommend the calamari fries. An up-and-coming restaurant chain with locations in California, Nevada, and New Mexico, Elephant Bar and Restaurant delivers delicious American and global dinner options for lunch and dinner. Their shareable options run the gamut from tempura salmon rolls to potato skins; they’re all good, so go with whatever you’re in the mood for. The multiple award-winning Café at Adele’s offers “the perfect balance between luxury chic and casual comfort.” Come in for breakfast, lunch, and dinner, or even just to sit and snack at the lounge. Their appetizer menu is extensive. Consider the deconstructed pork and beans or Dungeness crab infused tater tots. If you’re feeling adventurous, you could always go with the escargots en casserole. 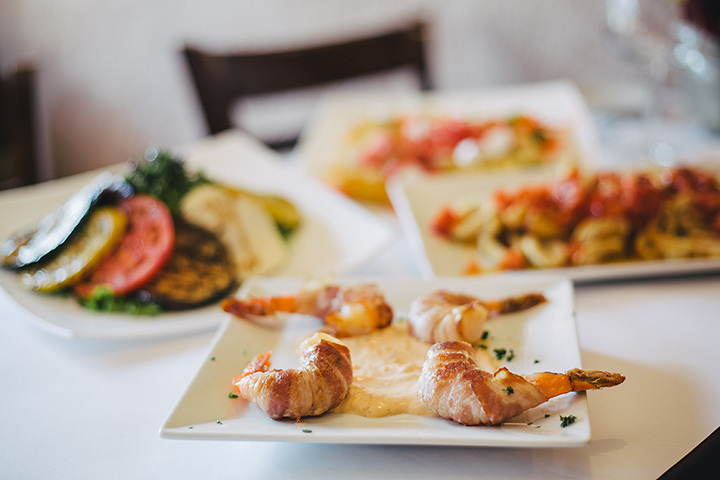 Stop by either the Las Vegas or Henderson location of Giuseppe’s Italian Grill for authentic, clean flavors, 24-hour gaming, and tremendous appetizers, including pizza fritta, stuffed hot peppers, barbecue jumbo shrimp, and more. What more, you ask? Macaroni. Cheese. Balls. You read that right. Simply one of the best barbecue spots in the state, no Fox Smokehouse BBQ meal is complete without an appetizer or two. The appetizer menu may be sparse with only four options on it, but each one is more delicious than the last, truly earning its spot on the menu. Our favorite? Gotta be the zucchini sticks. This cherished spot near Lake Tahoe will take you to your happy place with their thoughtfully curated menu. Their comfortable yet lively atmosphere is the perfect setting for the culinary trip you’re about to go on. Their menu includes plates like deviled eggs with prosciutto, a cheese plate, Spanish piquillo peppers stuffed with goat cheese and hazelnuts, and much more. Shared plates are encouraged, along with pairing your bites with one of their many wines, beers, or cocktails.